Porta-Bote - The Unique Folding "RV Dinghy"
Dawn arrives quickly at the Lake Whatsit RV Park. As the ruby sunrise fades to yellow, ducks flock shoreward for breakfast handouts. A kindly looking neighbor invites you fishing 'just as soon as I unfold my boat'. Whoops! Did he say unfold his boat? You smile politely and close the screen door behind you. But faster than you can think up a reason not to go fishing, your neighbor removes a surfboard shaped object from the side of his RV and proceeds to open up his boat - his Porta-Bote. There are three models available: an 8 footer, one that is just over 10 feet and the largest, at 12 feet; beams (width) are 56, 60 and 60 inches respectively. The smallest is rated for two people, the mid-sized for three and the largest boat can handle four. Constructed of polypropylene, a space-age resin, the Porta-Bote hull, itself is buoyant, and the craft will float even when full of water, according to the manufacturer. Foam flotation attached to the inner sides and seat cushions, plus marine grade plywood seats and transom add still extra flotation. Additionally, all three models have nearly 24' of freeboard. Those who enjoy the serenity and cardiovascular benefits of rowing will find Porta-Bote tracks very well under oar power. Due to its shallow draft, this nifty rower rides on top of the water rather than plowing through it. By coupling this high riding approach with a patented tri-hull configuration, Porta-Bote avoids amassing bow wakes under oar. Which means it really rows fast! Porta-Bote is ideal for fishing. Since it floats in just four inches of water, it launches as easily from shore as it does from the dock. Its shallow-water abilities allow it to reach those hard-to get-to places. And, its durable bottom is strong enough to ward off sharp submerged rocks or tree limbs. 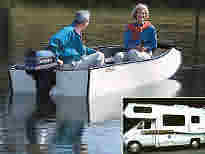 Folding Porta-Bote makes an excellent "RV Couple's boat". Add a small outboard motor (6 hp works well with the 12' model) and Porta-Bote will whisk you away to your favorite fishing spot at speeds up to 20 mph. For those who prefer their propulsion courtesy of the wind, Porta-Bote offers a sail rig option including leeboards, kick-up rudder/tiller, mast boom, sail and all necessary rigging. Porta-Bote hulls, according to the manufacturer, are as rugged as the new plastic auto bumpers, almost impossible to puncture. Back on shore, Porta-Bote folds back down to four inches flat. It can then be attached to specially designed locking RV mounts or simply placed on the roof of an auto with available car top straps. The manufacturer is so confident about its products that Porta-Bote comes with a 10-year limited hull-and-hinge warranty. The product has now been built for over thirty years. There are now over 60,000 owners out there.